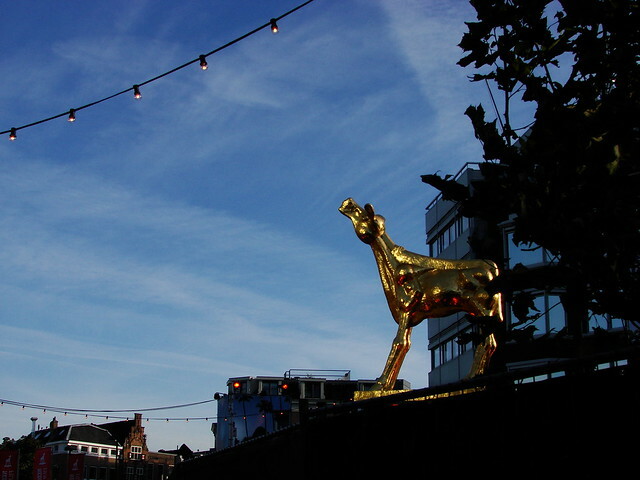 The annual Nederlands Film Festival is going on right now, and since the Stadschouwburg is undergoing renovation, the Gouden Kalf (Golden Calf) statue has been moved to Neude this year. 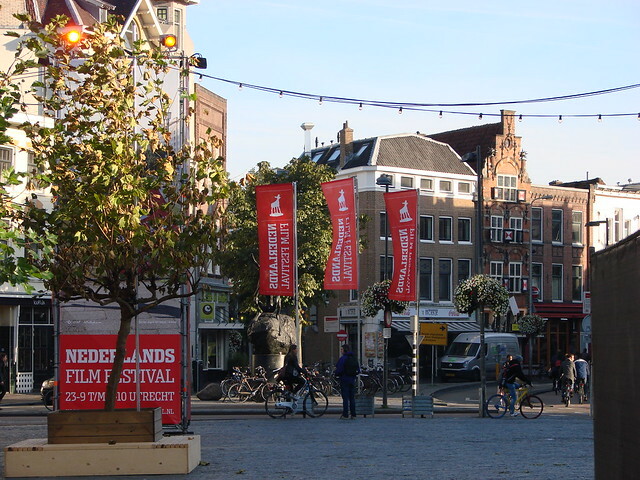 Neude has always been one of the spots for the film festival. Pippo and I used to go check out the setup in years past. This year, the old postkantoor (post office) is also being used for some of the festival events. 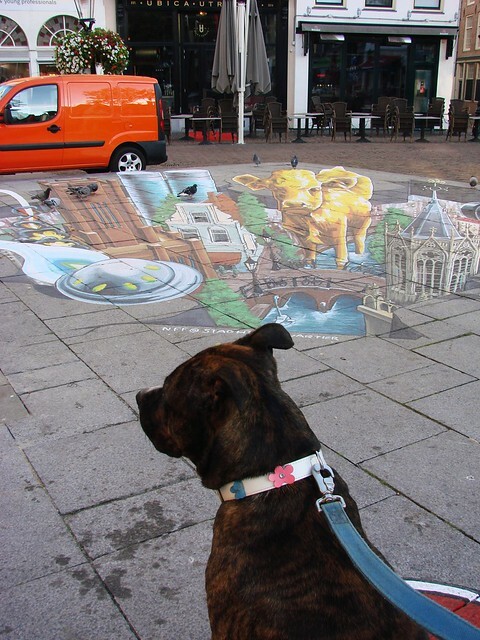 Charlie and I took a walk over yesterday morning to see the sights. 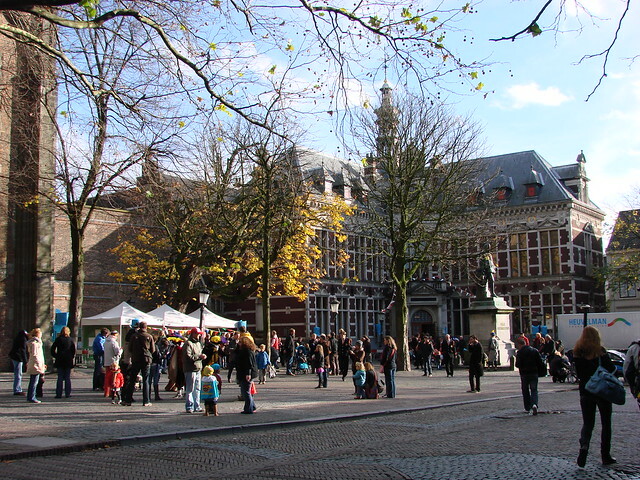 While the Gouden Kalf was one of the things I wanted to see on the walk, my main destination was the square behind the Stadhuis. 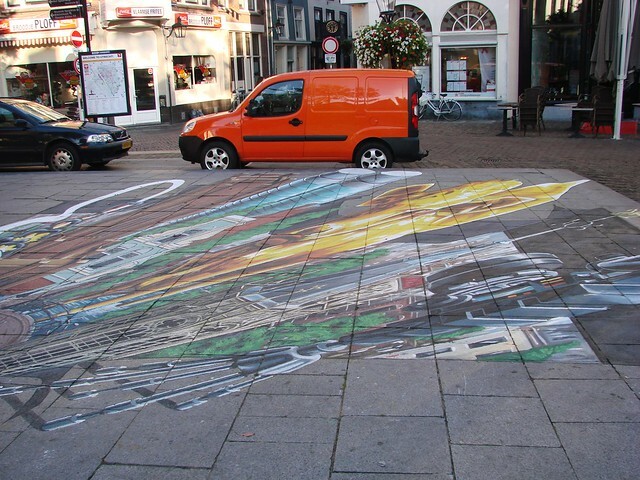 I had seen mentions on Twitter about 3D chalk art and wanted to see it for myself, especially before the festival was over or before the rains came again. We were fortunate to have come at it from the correct angle, so it was fairly clear to see the image right away. But as we stood there at the official viewing spot, we saw people coming from the opposite direction and actually standing on the piece and not having any idea of what it was. It wasn’t until they got to the viewing spot that they realized. 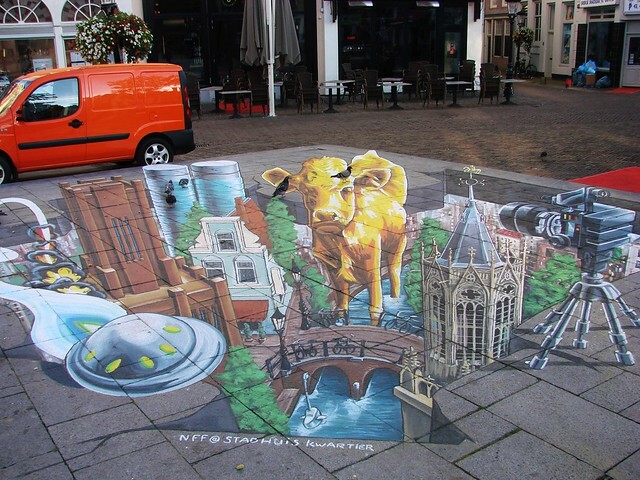 The piece depicts some of the symbols of Utrecht and the festival, with the Domtoren to the right, the Golden Calf in the center, standing in the Oudegracht, and the Inktpot with the UFO shown on the left, among other items. As I said, if you come at it from the right angle, it’s easy to see. But when you see it from any other side, you realize how unusual and impressive it is! I’ve seen photos of work like this before, but this was the first I’ve seen in person. 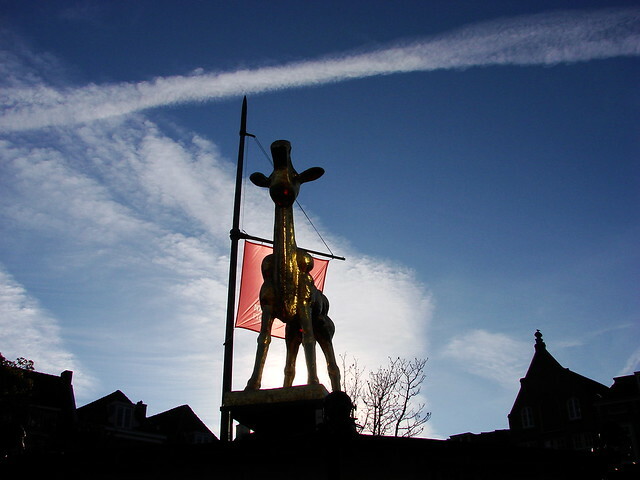 Definitely worth seeing, and a nice addition to the decorations around town for the festival. 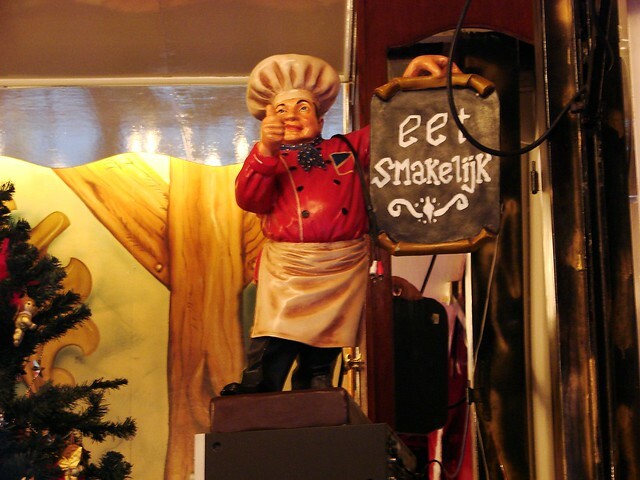 Somehow, despite the number of years we’ve been here, we had never gotten around to trying poffertjes. I’ve been familiar with them since our first year here and have seen bags of them for sale in the grocery store, and restaurants set up at the summer kermis (fair) dedicated to them, but somehow we’d never tried them. Then, a few weeks ago, I saw that this year, Neude would be home to a poffertjessalon this winter season. I knew the time had come to finally try them. 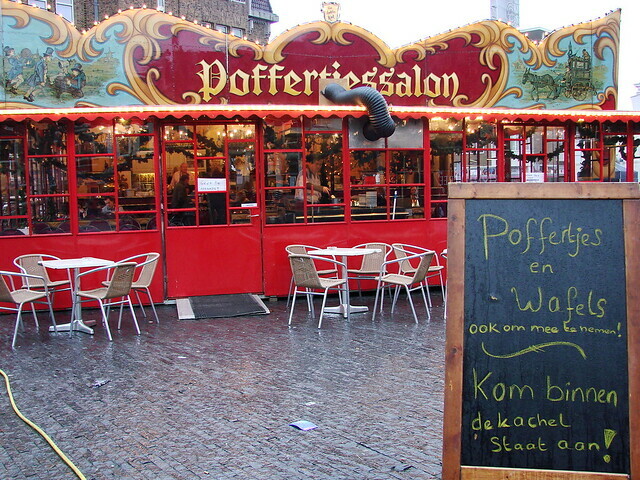 What are poffertjes? They’re sort of like mini pancakes (silver dollar size, for my American readers), but puffier. 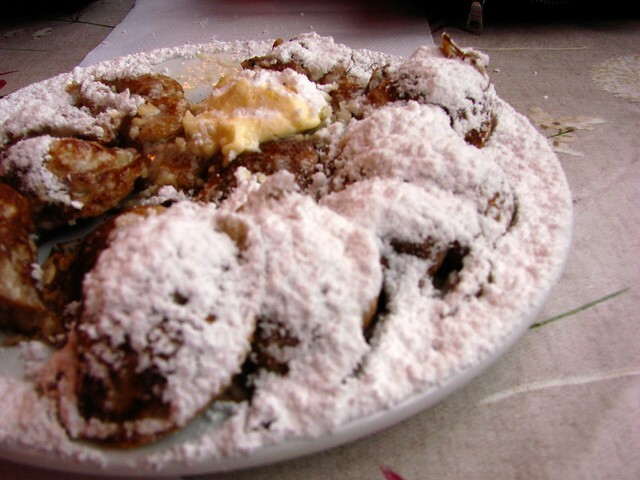 They come topped with butter and lots of powdered sugar. You can get other additions, as well, including a few liquor options such as rum and advocaat. Sorry for the less than stellar photo, but we dived straight in when the plate arrived and I was lucky to remember to get even one photo before they were all gone. They’re really tasty, without being overly sweet, despite all the powdered sugar. They reminded me a little bit of the beignets I used to eat in New Orleans at Café du Monde. For a temporary structure that is put up and taken down to travel around, it’s surprisingly nice inside. 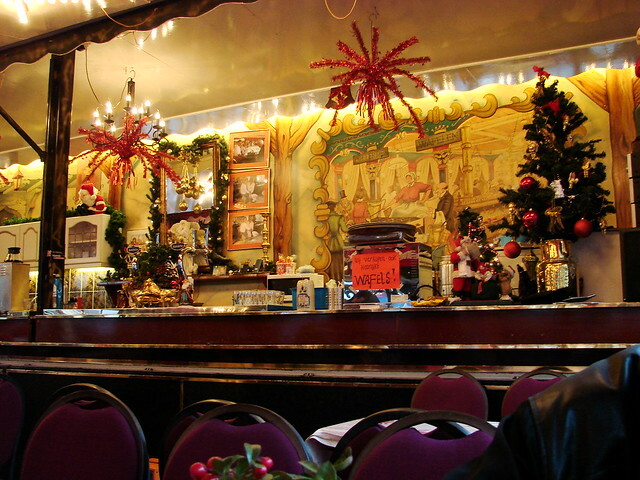 There are rows of long tables with tablecloths and centerpieces, and the décor is full of old-fashioned charm. 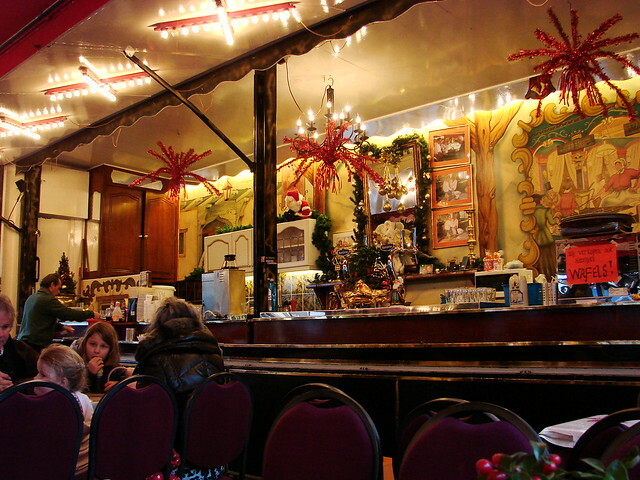 The poffertjes are made at the very front of the structure, but unfortunately, I didn’t get a photo of it. They’re made in a special pan with shallow holes specifically for the poffertjes. You can get small pans for home use, but the stalls use large table-size pans. You can see an example (and read more about the poffertjes) here. Now that I know just how good they are, I’m sorry we waited so long to try them! I’m going to be honest with you, this is a tired blogger’s post. It’s been a long week of writing, capped off with a lot of sneezing and stuffy nose issues the past two days. 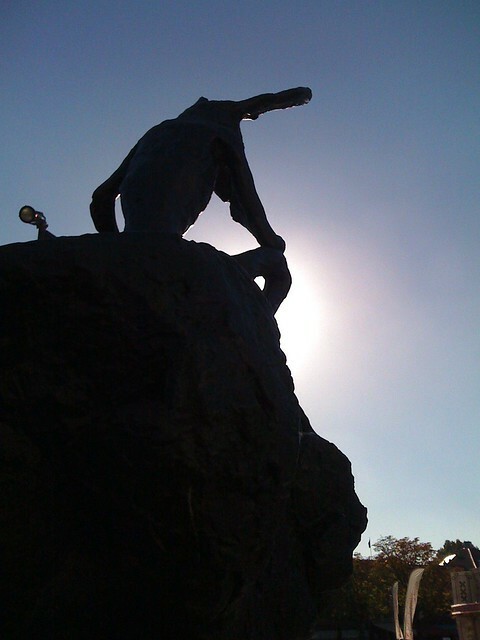 As a result, you’re getting a funky photo of the Thinker on the Rock sculpture over at Neude and a link to another article I wrote for the Arts Holland website. The Thinker photo was taken from behind, obviously, for the silhouette effect. It adds a certain dramatic element to it, I think. That sort of ties in to my article for Arts Holland about the current ARRRGH! 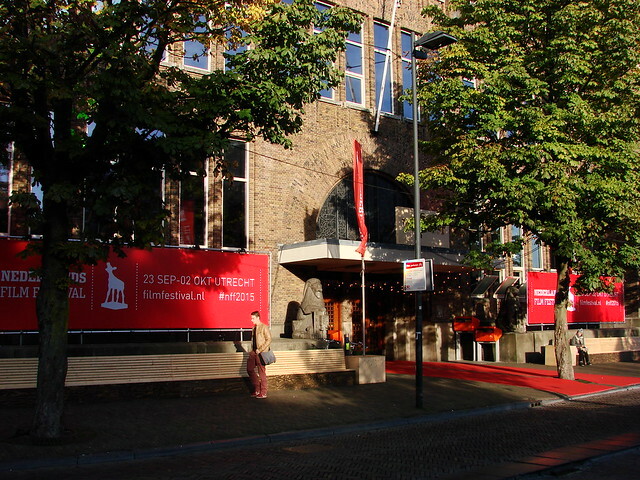 Monsters in Fashion exhibit at Centraal Museum. 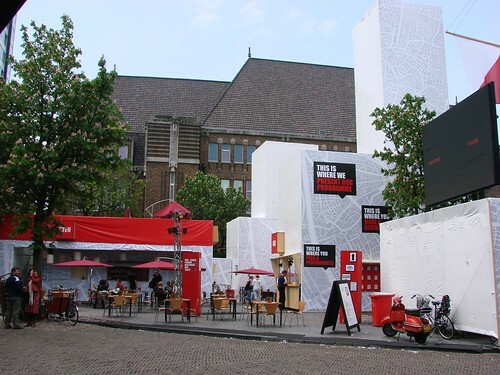 Between now and 19 January, if you’re looking for things to do in Utrecht, I recommend a visit to the exhibit. I’m not exactly a fashionista, but these avant garde pieces in the exhibit really were interesting to see. 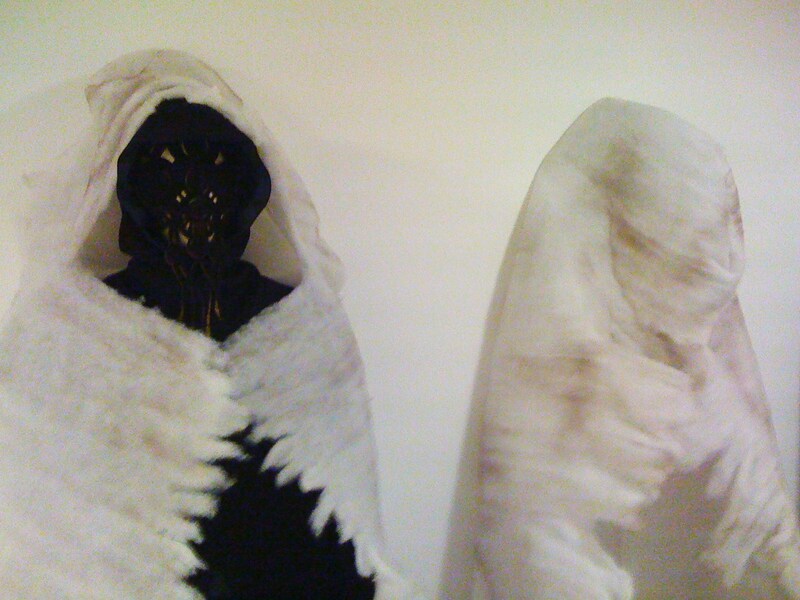 Even more interesting is the creepy vibe that goes along with the exhibit, thanks to how it’s displayed. Part of me wanted to stay and look at all the details; another part of me wanted to run out of there as fast as possible! But I mean it in a good way. It’s a brilliantly creative display, and how often can you say you’ve had the hairs on the back of your neck raised visiting a fashion exhibit in an art museum. 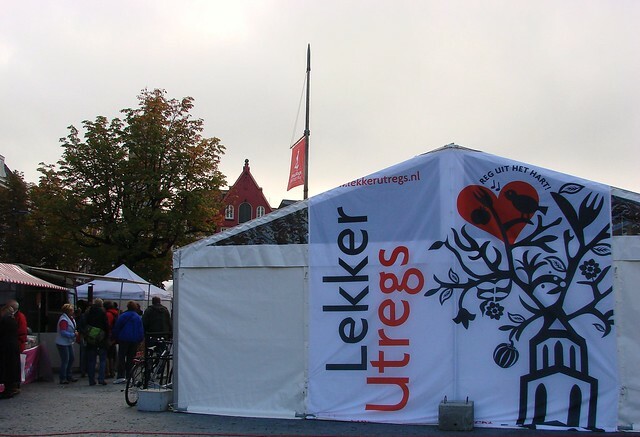 After being housebound for five days thanks to a vicious cold, I was feeling better today and headed out briefly to Neude to check out Lekker Utregs. It’s a festival celebrating regionally produced food, grown by everyone from balcony gardeners to professionals. 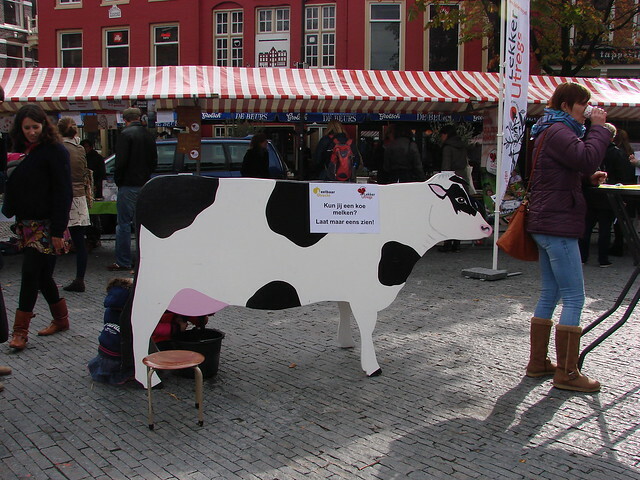 It was a nice mix of stalls selling their wares — vegetables, meat, honey, jams, cheese — as well as more interactive displays, including a chance to learn how to milk a cow, or should I say a “cow”. There was also a small petting zoo for kids, with a small pony, some sheep, a goat, a couple of rabbits, and some fluffy chickens who looked suspiciously like one of our neighbors. 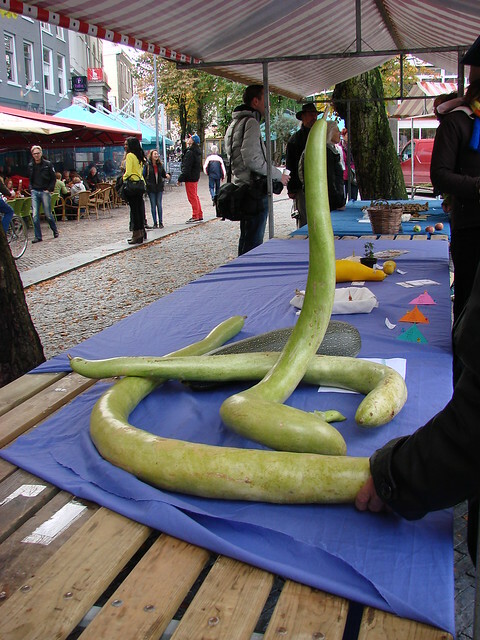 There was also a display of “extreme groenten”, showcasing some of the more impressive and unusual vegetables locals have grown. If all the food was making you hungry, some of the stalls had some free samples. I particularly enjoyed the fenugreek cheese. In addition, there were food trucks and other stalls set up offering burgers, pizza, desserts, and pancakes to sate your appetite. It wasn’t all food, though. 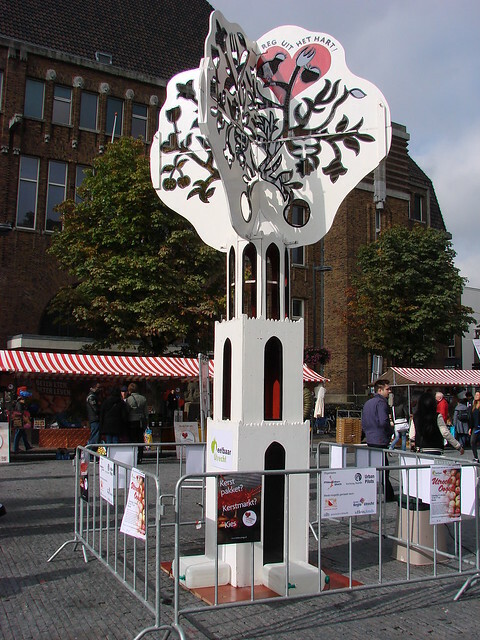 There were a few musical performances, and in the center of the square stood an art piece by Utrecht wood artist Jules Enneking, which turned the Domtoren into festive tree. 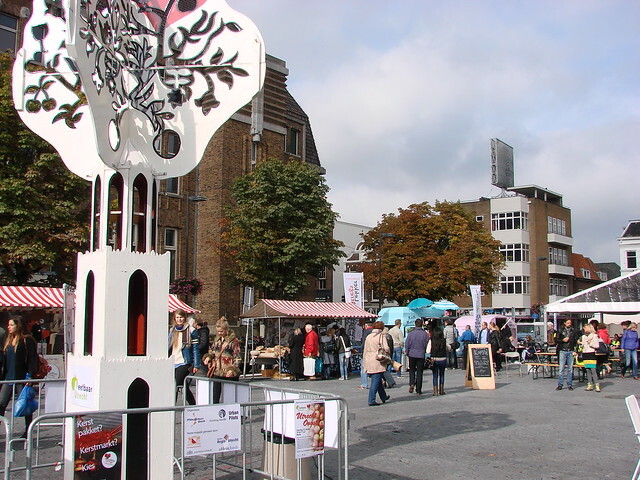 Numerous events were planned for throughout the day, including discussions and debates about the value and importance of local food sourcing. 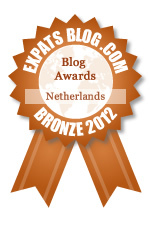 All in all, it was a nice way to ease my way back into life in Utrecht. As a side note, unfortunately, my camera is having issues, so photos were limited (and others disappeared) that better represented the event. Think positive thoughts that it can be easily and cheaply fixed! 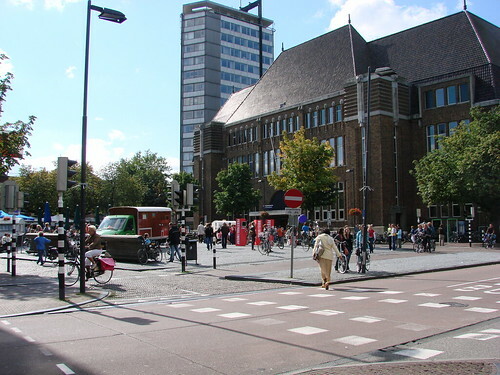 A pilot program exploring the benefit and use of free WiFi in Utrecht has begun. 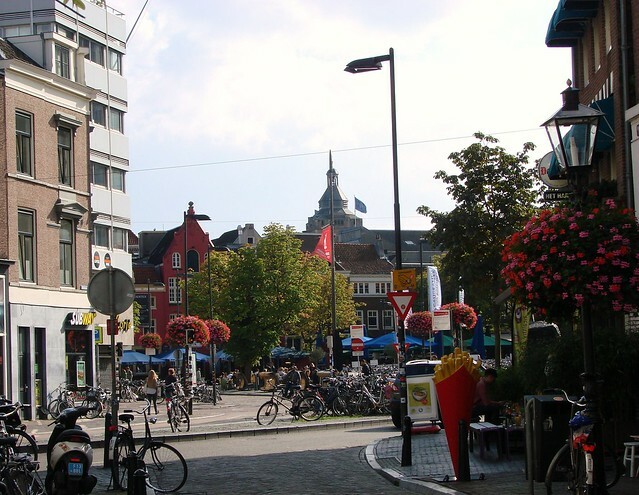 For the rest of the year, free WiFi will be available at four of the city’s main squares: Domplein, Neude, Stadhuisplein, and Vredenburg. It kicked off at Neude last Friday and I stopped by on Saturday and sure enough, it was working. The rest of the squares have gone online this week. So if you’re in town and want some free WiFi access, now you know where to go. No special passwords needed. 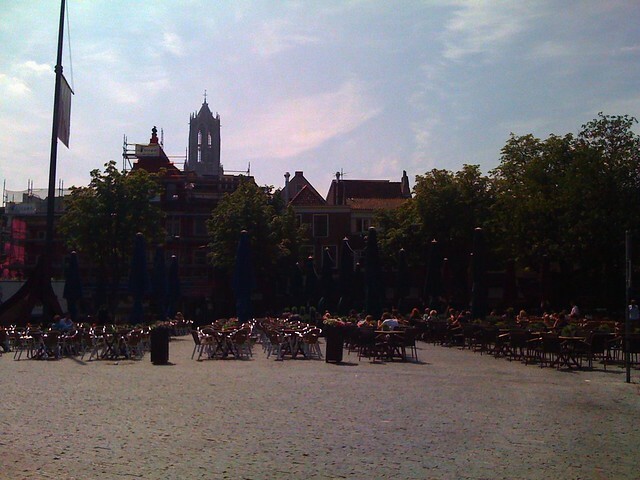 Edited 6/10/14: By the end of 2014, there will be free wifi throughout the city center and it will also be available at Griftpark and Willhelminapark. 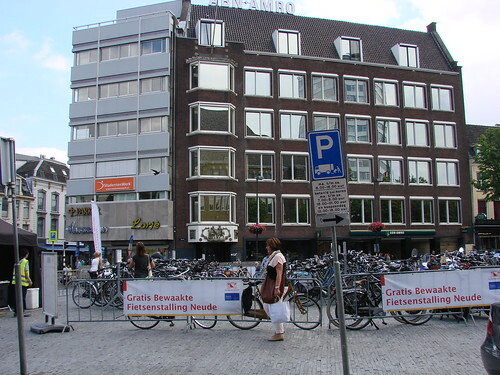 Edited: July 2015: There is free wifi throughout the city center and at the spots mentioned above, as well as on Biltstraat and other individual locations outside the city center. 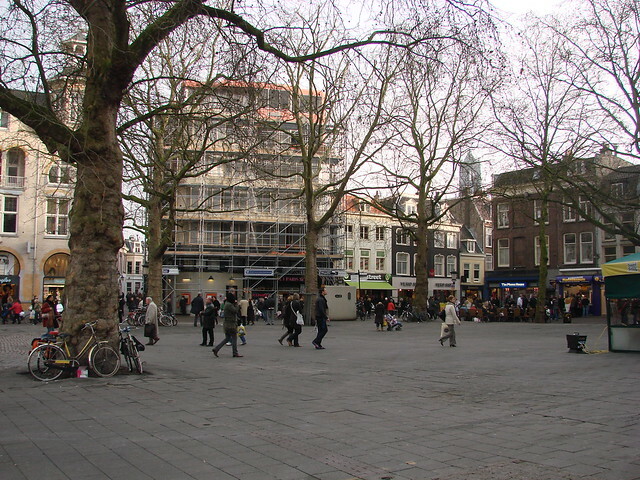 In other words, there is extensive free wifi throughout Utrecht. Enjoy! LEGO is holding a vote for a great architectural icon to be considered for a LEGO build. 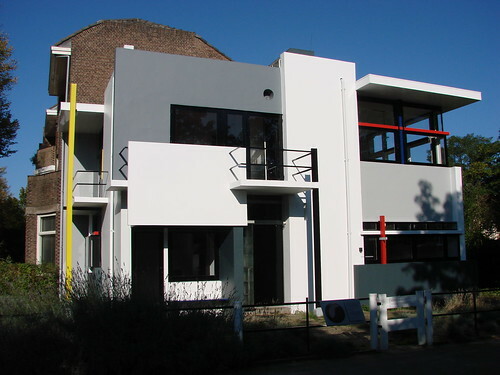 The Rietveld-Schröder House is one of the buildings up the vote, so I hope you’ll cast your vote for my favourite Dutch architect. Voting is easy and requires no registration. Just go here and vote (it’s the middle building on the second row). 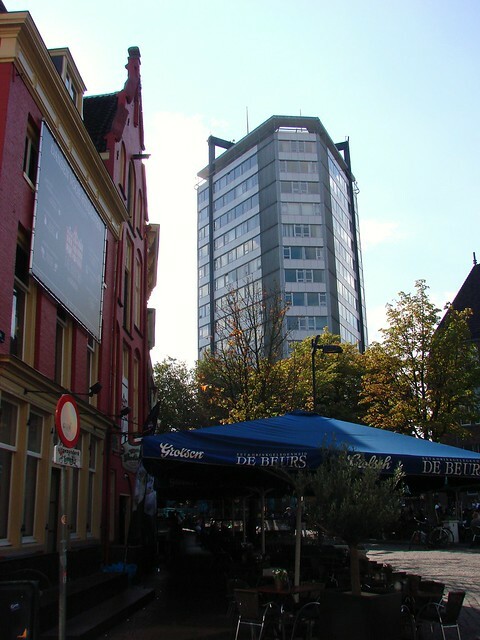 It’s up against some much better-known buildings, so it would be nice to see it get some more votes. Rain and work has kept me indoors and away from the blog, and now it seems I’ve missed my chance to get some better shots of the hodgepodge buildings in Neude that I mentioned last time. 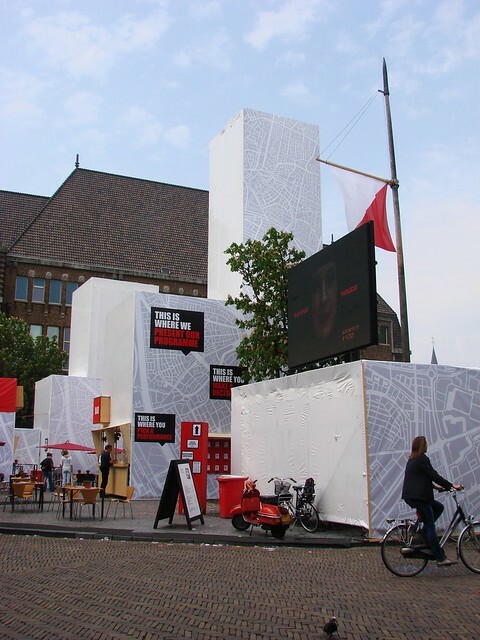 The three container buildings were made from materials found around different neighborhoods around the city. They’ve been hosting various activities this week, including DJs, drinks, and snacks. 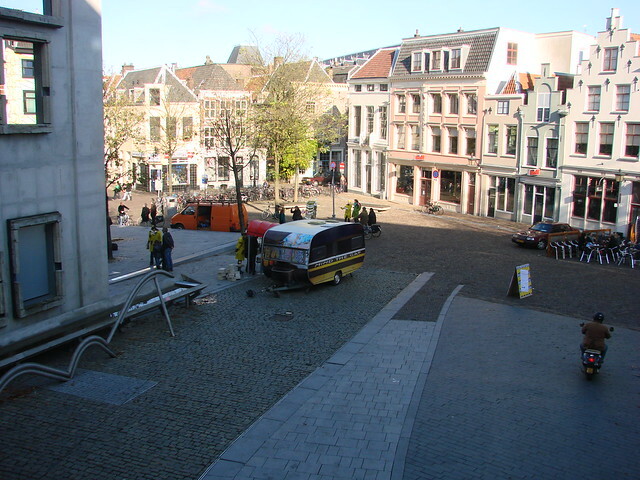 You can read more about Straat Lokaal here (in Dutch, but with photos).